In our tech connected computerized world the population can be sorted into two categories. Computer people and non-computer people. To quote a famous saying, "two peoples separated by a common language." In an effort to help those who have issues with the computer world, I have created a flow chart to let you in on some of the techniques computer people use to deal with unknown software issues. While this is a humorous take on the subject there is an enormous amount of worthy truth in the message. Let it sink in, then use this technique next time you are facing a computer challenge. Especially apropos for the non computer person is the advise to "Give up after half an hour". 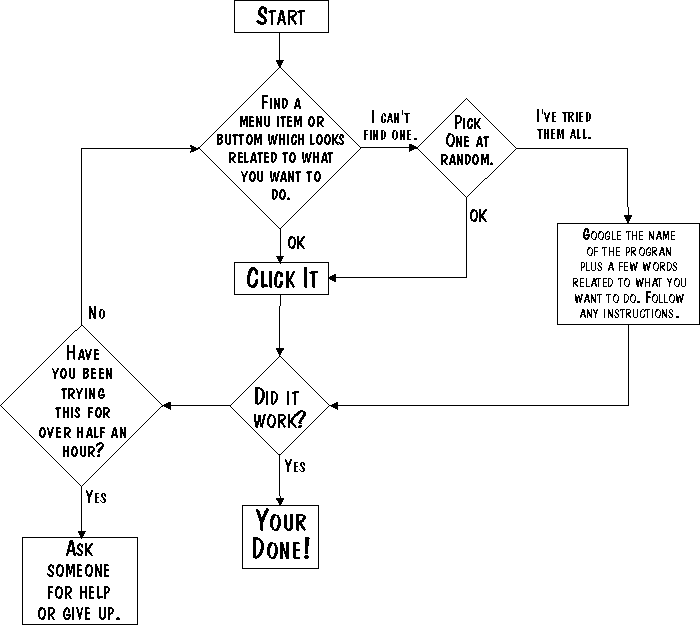 Print this flowchart out and tape it by your monitor, congratulations you are now a computer expert!